Jeff Shaara’s last installment in his Civil War series is the story of William Tecumseh Sherman, and the final eight months of the war. The Fateful Lightning picks up Sherman’s march immediately after the sacking of Atlanta and follows his army through Georgia and the Carolinas. There is little middle ground in the world of Civil War analysis regarding Sherman. The general is either hated as savage and brutal or respected as the finest battlefield commander of the war. The Fateful Lightning, through Shaara’s use of the historical novel, brings a semblance of balance to the Sherman legacy. Shaara’s research is excellent. Like all of Shaara’s writing, using the vehicle of the novel, the key players are humanized. The genre also allows for the creation of fictional characters to flush out the story line. In this case a young slave, freed by Sherman’s march is among the thousands of former slaves who follow Sherman’s army of liberation as it heads north, taking them away from their masters and plantations. The story of freed slaves following the Union Army is also well told in another book, E.L. Doctorow’s The March. Search gordonsgoodreads for an overview. I also recommend the other three books in Shaara’s series. A Blaze of Glory, A Chain of Thunder, and The Smoke at Dawn. You will find my overviews of them here at gordonsgood reads. 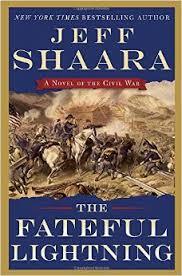 Shaara also wrote Gods and Generals and The Last Full Measure, two novels that complete the Civil War trilogy that began with his father’s The Killer Angels. In her new book, The Kings Curse, Philippa Gregory adds multiple chapters to the madness of the Tudor Court of King Henry VIII. If you enjoyed her best-selling novel The Other Boleyn Girl, you will be very much at home with The Kings Curse. The story comes through the voice of a new narrator, Margaret Pole of the Yorks, part of the Plantagenets, and considered a rival to the Tudor Throne. 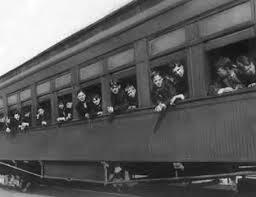 All of the great characters of the period are interwoven throughout the book. The demise of Katherine of Aragon, the rise and fall of Anne Boleyn, Mary Boleyn, Cromwell, Cardinal Wolsey and of course Henry VIII himself. Throughout the novel the crafty and devious Margaret Pole masks her disdain for the Tudors in an effort of save the lives of her sons and Henry and Katherine’s only living child, Mary, the legitimate heir. 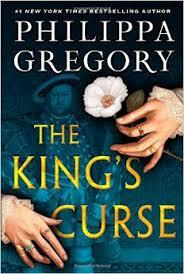 It is indeed the King’s curse, that he has no legitimate son to continue the Tudor Dynasty. 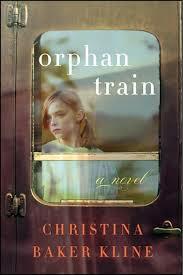 Gregory’s research and attention to detail is impeccable and her literary style is fast paced. There is never a long wait at the starting line. President Lincoln’s brilliant decision to elevate Ulysses S. Grant to General in Chief of the Union Army following Grant’s victory at Vicksburg on July 3, 1863 was further justified by the success of Grants first assignment following his promotion in the battle of Chattanooga, Tennessee. 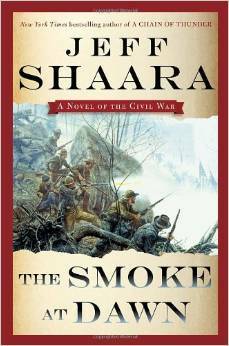 Jeff Shaara in his new historical novel The Smoke at Dawn , the third in his Civil War Trilogy, places Grant in the Cumberland following the Confederate defeat of General Rosecrans by Braxton Bragg at the Battle of Chickamauga Creek. Grant immediately demoted Rosecrans and replaces him with General George Thomas and brings in Sherman’ s army for support. The Union army has been under siege in Chattanooga and Grant orders the siege broken at whatever the cost. Bragg, sinking in his own bombast and his repeated failure to lead , is on the verge of converting a great Confederate victory into a bitter defeat. As Sherman rides to the rescue of General Thomas and the Union Army, he makes a rare mistake by misreading the geography, giving Bragg one last chance of grasping victory from the jaws of defeat. There is plenty of drama as Shaara tells the story of this epic battle with the versatile vehicle of historical fiction that , following in his fathers footsteps , is his trademark. Shaara is the son of Pulitzer Prize winning Michael Shaara, author of The Killer Angles. The two previous novels in the trilogy are A Blaze of Glory , the battle Shiloh and A Chain of Thunder, the Siege of Vicksburg. Search gordonsgoodreads.com reads for other Jeff Shaara historical novels based upon the Revolutionary War, Civil War and World War II. Dark Fire is the second of the Matthew Shardlake Mystery Series written by the acclaimed historical fiction novelist C.J. Sansom. If one is looking for a painless way to enjoy the history of Tudor England ( Henry VIII) read all of this wonderful Sansom series which begins with Dissolution and currently ends with Heartstone. The search for the secret of Dark Fire, desperately sought by Thomas Cromwell on behalf of Henry VIII ,leads lawyer Shardlake through the perils of multiple murders and further intrigue. Anne Boleyn has already been beheaded and Anne of Cleves, the fourth wife of Henry , is about to be dethroned in favor of Catherine Howard. Amidst the turmoil of the king’s wives, Cromwell seeks to protect his own position by providing the monarchy with the formula for Dark-Fire, an ancient form of flame thrower, which in its day, in warfare, was akin to a modern-day nuclear missile. He turns to Shardlake to unravel the mystery and find this weapon for the king. 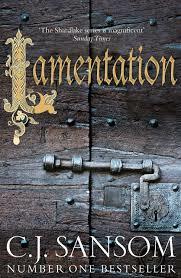 As is usual with Sansom, there is a parallel plot, this time involving Shardlake trying to keep a young woman falsely accused of murder from death by torture, of course in the Tower of London. Dark Fire is a highly recommended gordonsgoodread! If you are new to Sansom pick up his work and read them in the following order: Dissolution, Dark Fire, Sovereign, Revelation and Heartstone. 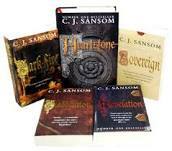 Overviews of these Sansom books can be searched at gordonsgoodreads.com. Finish these and you will be a well-informed conversationalist regarding Tudor England.The Sansom novels present history and humanity folded together in perfect form.